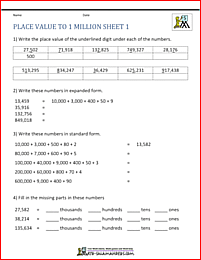 Welcome to the Math Salamanders 4th Grade Place Value Worksheets. 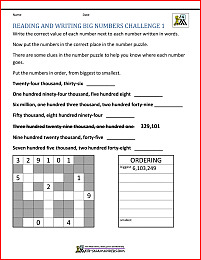 Here you will find a selection of math worksheets to help your child learn to compare and order numbers up to 6 digits. The worksheets on this page will help your child learn to order and compare numbers with up to 5 digits. They will also help develop the understanding of place value and standard form. The first two sections are about comparing and ordering 5 and 6 digit numbers. The last section contains more challenging sheets designed to stretch more able mathematicians. The problems below involve using place value, rounding, ordering and divisiblity tests to complete the challenges. They are at a more challenging level than those above. 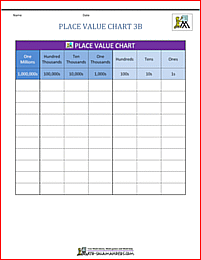 Our 3rd grade place value sheets involve learning place value numbers up to thousands. Our 5th grade ordering worksheets involve ordering larger numbers up to 100 million. The sheets are similar to those on this page, but are at a harder level. We have a selection of place value charts. The charts cover a range of numbers going from ones up to hundreds, thousands and millions. They are a good supporting resource for children who are finding place value difficult. They are also a good way to get children to become familiar with how the number system works. Here you will find a range of printable mental math 4th grade quizzes for your child to enjoy. A great way to revise topics, or use as a weekly math test or math quiz! Here you will find a range of printable 4th grade math puzzles for your child to enjoy. All the puzzles support elementary math benchmarks for 4th grade. Here you will find a range of free printable 4th Grade Math games. All children like to play Math games, and you will find a good range of Grade 4 Math Games here for your child to play and enjoy. The following games involve different 4th Grade Math activities which you and your child can enjoy together. All the free 4th Grade Math Worksheets in this section support the Elementary Math Benchmarks for Fourth Grade.